Dog silencers are fantastic tools to get your dog’s or your neighbour’s pooch’s attention to stop it from barking or from creating any unwanted noise. It is one of those gadgets that you can use, as its name implies, to ‘silence’ a dog or its tag, albeit not permanently of course. In this guide we share what our research has shown to be the nine best dog silencers today. The Casfuy anti bark device is a nifty gadget that is integrated into an ordinary looking dog collar. The good thing about collar is that it is fully adjustable to fit almost any size of pooch. What’s really amazing about this dog barking silencer is that it comes in 3 different training modes complete with 7 levels of correction settings per mode. It does come with static shocks but not really hurtful to your canine friend. You can always start with the progressive levels of sonic correction before you head over to the vibration mode. If your dog has grown accustomed to the vibrations, then you can start delivering static electricity just to startle your pooch a bit. 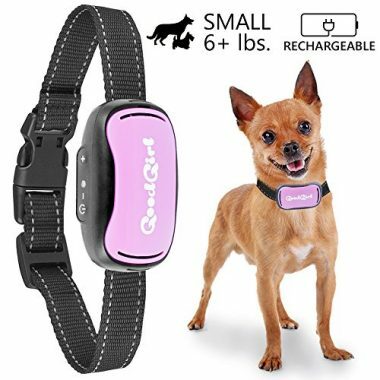 The Casfuy Bark Collar bark deterrent device comes with a proprietary Smart Barking Detection technology that allows it to recognize only the noise or bark produced by your dog and not another pooch from your neighbor. 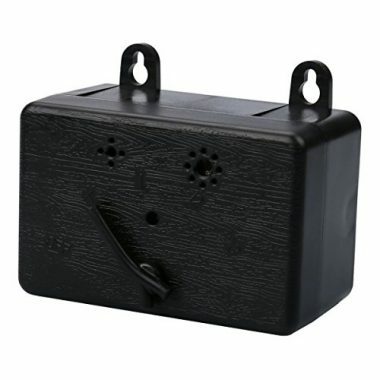 This works through its vibration detection sensor instead of the usual acoustic sensor typically seen in other products. What this simply means is that when your dog barks, it produces vibrations, thus, activating the Casfuy. Even if there are dogs barking from across the fence, the gadget will not be activated since no vibrations from your canine pet are detected. Casfuy also comes with a built-in safety feature. 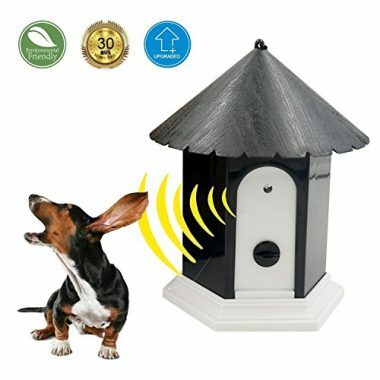 If your pet has been barking incessantly that the device was set off 7 times in one minute, it automatically shuts off. After about a minute, it powers on again. The collar also features a safety reflective trim to improve visibility in the dark. And unlike other battery-powered products that will last only several hours, Casfuy comes with a smart battery that can last up to 20 days, although the usual operation will net it about 14 days. It’s also lightweight and rainproof so your pooch will not have any issues wearing it, rain or shine. So, if you’re looking for the best dog barking silencer, this is one gadget you’d want to get. 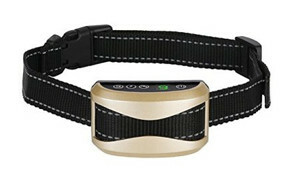 The Casfuy Bark Collar is well and good when controlling the incessant barking of your pet. 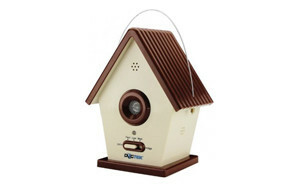 However, if the main concern is not your dog but rather those from your neighborhood, then Dogtek’s Sonic Bird House Bark Control contraption is a great choice. 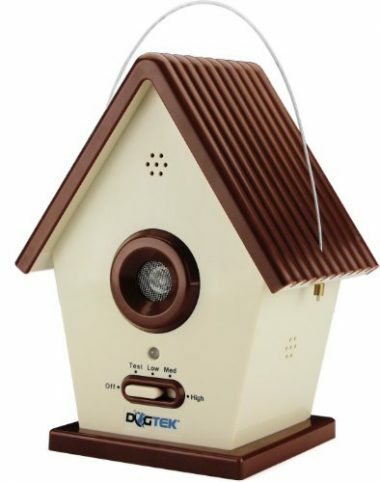 Designed like an elegant bird house, the Dogtek ultrasonic dog silencer is built for mounting on branches of trees, your lamp post, or any other fixture outside your home without having to worry about the weather. The ultrasound dog bark control device emits an ultrasonic frequency sound that should be quite unpleasant to canine hearing, but safe to humans as they won’t be able to hear it. The Dogtek comes with an acoustic sensor that senses barks up to 50 feet away. Once the sound has been registered, it emits an equally sensitive acoustic signature that is picked up by dogs. But here’s the thing. As effective as it may be, the Dogtek simply won’t work on pets that have diminished hearing. Nevertheless, with 4 sensitivity settings, it should be a great way to control the barking behavior of dogs in your area. First of all, the Quiet Spot is not an anti bark device. It is a small pouch that you attach to your pet’s collar and insert its tags in. 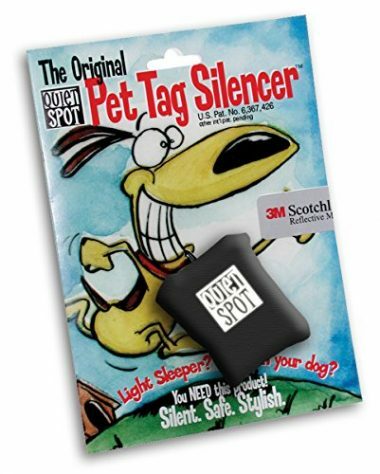 Quiet Spot is one of those dog tag silencers that are designed specifically to prevent the jingling sound created by dog tags as the pooch moves. You see, even if pets don’t bark, if they scratch their dog tags tend to create an annoying sound. As such, putting these tags inside the Quiet Spot Pet Tag Silencer should do the trick. It’s spacious enough to hold 4 standard-thickness tags. The Quiet Spot comes with a reflective logo over its waterproof neoprene fabric material. Now all you need is to choose an appropriate color to match your pet’s collar. If you don’t like putting your pet’s tags inside a pouch like Quiet Spot, then a better alternative is to use ThunderShirt’s ThunderCover. These dog tag silencers work more like a transparent casing that snaps shut with the tags securely inside. Since the tags are compressed inside the plastic casing, they won’t move around and create sound. 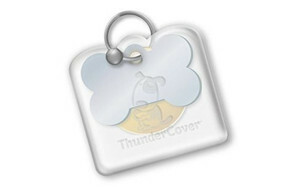 The ThunderCover is big enough to accommodate almost any size and shape of tag. 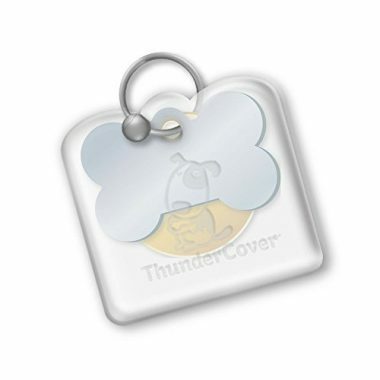 However, one of the recurring complaints about the ThunderCover is that it might be quite challenging to open the casing to read the information on your pet tags. It is technically okay if you only use 2 tags, but if you insert 3, then you won’t clearly have access to the middle tag without opening the ThunderCover. Nonetheless, it’s a nifty device for preventing pet tag noise. The Lylyzoo Anti Barking Device works pretty much like the Dogtek Sonic Bird House. It has an effective acoustic sensitivity range of about 50 feet to emit an ultrasonic frequency noise. Unlike the Dogtek however, the Lylyzoo is designed more like a cottage house complete with a chimney for a different aesthetic appeal. It can be hung from tree branches but should not be higher than 5 feet from the ground. As such, we think it is best to put this ultrasound dog bark control device on the railings of your porch. Its durable and weatherproof design is perfect for outdoor use, although you can always place it inside your home. The Lylyzoo comes with a LED indicator light so you’ll have an idea when it’s time to replace the 9-volt battery. This bark deterrent device is slowly finding a number of happy customers signifying its effectiveness. The problem with the Quiet Spot and the ThunderCover is that you will still have to fumble opening them so you can read the information printed on your pet tags. It really is quite a cumbersome way to manage the rattling and jingling noise of pet tags. This is addressed more efficiently by FreezeTag’s Dog Tag Silencer and Connector. These dog tag silencers from FreezeTag have a very simple loop and snap design. 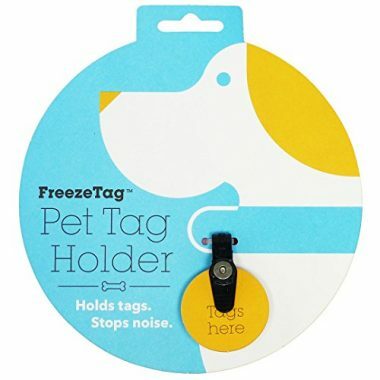 All you need is to insert the hole of your dog tag through the FreezeTag and secure it with its built-in screw. Loop it around your pet’s collar, snap it shut, and you’re done. Since there are no materials covering the tags, you can easily gain access to whatever is printed on the tags. The FreezeTag can easily hold and secure 4 tags with standard thickness so they won’t be clanging against each other. Now that is one sure way to keep your baby well-rested without the jingling sound of pet tags. You wouldn’t really believe what is inside this unpretentious, no frills black box that comes with 2 hooks on top. 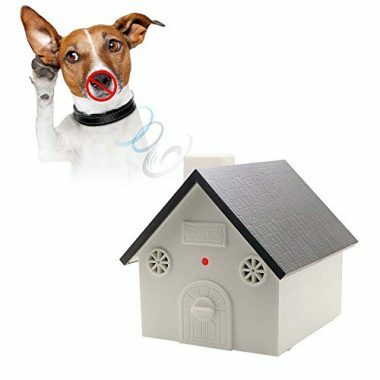 For most of us who don’t know any better the BIG DEAL Mini Outdoor Anti Barking Device looks more like small block of alarm. Its design is so inconspicuous that you won’t even notice it. Perhaps it is because of its rather unassuming design that this ultrasonic dog silencer works exceptionally well. It has an effective range of 50 feet and lets out a canine-only audible sound. Sadly, like all ultrasound dog bark control gadgets, if your pooch happens to be hearing impaired, then it simply won’t work regardless of how loud you want to set the noise correction. Nevertheless, it’s a safe and truly efficient way to manage dog barking in your neighborhood. Even if you don’t have any pooches in your home, but your neighbors have, then this should be a great way to deal with it. The HappyHapi is a dog bark suppressor that works essentially in the same way as the other ultrasonic dog silencer products in this list. It emits a noise that only dogs can hear and is duly activated by dog barking from as far as 50 feet away. It comes as a hexagonal bird cage with a conical roof allowing it to be easily mounted or even hung outdoors or indoors. You also don’t have to worry about is weatherproofing as it is built for the task. The important thing to remember is to place it within 50 feet of where you want the barking to be controlled. So, if the issue is your neighbor’s dog, then placing the HappyHapi on the fence post that you share with your neighbor or even on a nearby tree limb should do the trick. The great thing is that it won’t hurt your pet unlike other mechanisms that aim to deliver electric shock. We can say that the GoodBoy is an excellent alternative to the Casfuy except that the GoodBoy dog barking silencer doesn’t deliver electrostatic shocks. It only provides acoustic and vibratory corrections, each with 7 progressively increasing levels of intensity. It has a rather cute and adorable design and comes in 2 colors, pink and blue, supposedly for female and male dogs, respectively. The collar fits the neck of almost all breed sizes as long as it doesn’t go beyond the 19-ince circumference limit. For smaller breeds, GoodBoy comes with a Mini Bark Collar that is perfect for pooches that weigh at least 6 pounds. Conventional collars have a minimum canine weight requirement of 15 pounds. Going back to the GoodBoy, its acoustic and vibration sensors are well-protected with a fully waterproof casing so pets can go swimming with it. GoodBoy also comes with fully rechargeable batteries so you don’t have to buy every now and then. GoodBoy anti bark device is excellent for those who wish to train their pets against barking without inflicting harm to their pets. Choosing a dig silencer requires an understanding of a few basic things. While we have shared with you 9 of the best dog silencers in the market, you may want to search for your own. In doing so you may need to consider the following items before you make that decision to purchase one. If you’re entertaining the idea of getting an electronic bark deterrent, the maximum effective range is an absolute must. It should be able to provide a wide-ranging coverage. Most of the products today have a range of 50 feet, although there are some that can reach up to 200 feet possibly even more. These gadgets are activated by the distinct sound of a dog’s bark. As such, these should be sensitive enough to register a dog’s bark and not be accidentally set off by a loud noise in your neighborhood. For example, if your neighbor happens to have a V12 under the hood of his car, this can create a rather loud noise that can set off the device. For your dog, it will be puzzled as to why it is hearing an ultrasonic noise when it is simply resting in its bed. Thus, the device should have sensors that are specific to a dog’s bark. Collar types of anti bark device units are also defined by an effective range. Unfortunately, once they are out of range, you simply cannot provide a correction anymore. This is where a remote control mechanism can come into play. You might want to give this a shot if you want such a device. Regardless of the type of dog barking silencer you choose it should be fairly easy to use. It should also not require too much maintenance. If it is battery-operated, then replacing or recharging the batteries should also be simplified. What is a Dog Silencer? A dog silencer is a gadget that is composed of two fundamental parts: a sensor and an actuator. The sensor gathers auditory signals that resemble the bark of a dog. When one is registered in the sensor, it activates the actuator mechanism to produce a reaction. Depending on the type of dog silencer, the action can be in the form of an ultrasonic frequency sound that only dogs can hear. In collar types of devices, the action can be in the form of either vibrations or electrostatic shocks. Experts and most dog owners don’t recommend using the shock as a means of correction. While these may not hurt the dog, it is still classified as an example of aversion training. If a dog barks within the effective range of the gadget, it activates the device to let out a correction to get the pooch’s attention. This stops the barking. Unfortunately, we all know how adaptable dogs are. Using this every now and then can numb them from the correction. There are different types of dog silencers in the market. 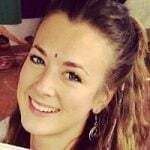 Each one comes with its own distinct advantages as well as disadvantages. Here are some of the more common types. 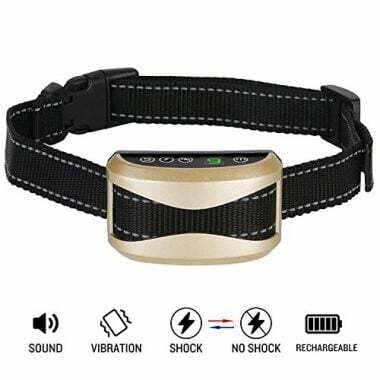 These are almost similar to your electronic dog collar that delivers a premeasured electrostatic discharge to startle your pet if it barks. As we have already said, most canine experts do not recommend the use of electric shock no matter how safe manufacturers claim it to be. These are classified as part of aversion training where the dog learns punishment and not necessarily the positive or desirable behavior. As we have mentioned above, there are devices that are sensitive to “any” kind of sound. As much as possible you need to avoid these as they will register almost every other sound, triggering a corrective action that your pooch will be so baffled as to why it is being given such a scream. Compared to sound sensor controllers, those gadgets that come with vibration sensitive mechanisms provide a more on-dog control of barking. Since these gadgets are made part of a pooch’s collar, whenever it barks it creates vibrations that get registered in the device’s sensors. This triggers the corrective action so that the pet will stop barking. The only problem with this technology is that it is dog-specific. If your pooch is exchanging barks with another dog, you can make your pet stop but not necessarily the other dog since it doesn’t have a vibration sensitive controller. These gadgets let out a specific acoustic frequency that only dogs will hear. The only problem with such devices is that it doesn’t take into account the changes in hearing acuities of dogs as they move across the lifespan. Puppies generally respond best to ultra-high frequency sounds while adult canines can easily respond to audible blasts. If the device has a feature that allows it to be set to the correct frequency, then it will be an excellent choice. There are also devices that squirt a fluid that contains lemon or some other natural substances that dogs are known to be especially averse to. This is instead of delivering shocks, vibrations, or ultrasonic sounds. The only issue with these devices is that it can be quite messy since the spray can get onto your carpet, furniture, and even beddings. You will have to take care of the smell later on. Sadly barking is not only the noise that you may want to address. Just as your keychain can produce distracting noise inside your pocket or purse with every movement, so do the tags on your pet’s collar. This can be quite annoying especially if you have a baby who simply needs to sleep in the afternoon. This is actually not your pet’s fault because it is actually you who put the tags on its collar. As such, you can try using dog tag silencers to help organize the pet tags so they won’t be hitting each other. You have to understand that dog silencers offer temporary relief to the incessant noise created by canines. It is only temporary since dogs have the uncanny ability to adapt to correction levels employed. The device may work now, but use it very often and your pooch will simply shrug it off as nothing more than a temporary distraction. It should be remembered that, unlike us humans, canine species lack the capability to communicate in terms we really understand whatever it is they are trying to communicate. Barking, in this sense, is one of their ways of communicating to you something. It could be a threat, a longing for attention, or simply boredom. 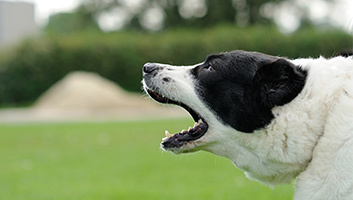 There are many reasons why canines bark. As such suppressing this instinct is often considered as not a good sign of pet ownership. What is more important is to train our canine friends when it is okay to bark. That said, when used judiciously with sensible canine obedience training, these dog silencers can provide a variety of benefits. Use it wisely and your pet will learn when to bark and when not to. Just make sure that you understand the principles of canine obedience training so that you can optimize this particular benefit. For most people, they don’t mind a dog barking in the middle of the day. But if it is in the dead of the night, it can be a real nuisance since all you want is to be left alone in your bed without any distracting noise. Using these devices can help you secure a more peaceful and restful sleep at night. Just as you would like to get some much-needed sleep at night or whenever you feel like it, your neighbors actually feel the same way. While you really cannot make your neighbor to do the same thing to his dog, at any rate, you’re doing your part to keep the neighborhood a lot more pleasant and peaceful especially at night. You also don’t have to worry about getting complained of by your neighbors. It may not be evident at first but teaching your dog when and when not to bark simply strengthens the owner-pet relationship. It knows that you are there teaching it the best possible behavior of a good dog and pack member. This instills trust that dogs will value for the rest of their existence. Dog silencers will never work if you don’t train your pet. They essentially go hand-in-hand. When choosing the right gadget for your pet’s barking, it is important to look at the various features that the product has. It is also important to understand the different types of dog silencers so you will be more confident in choosing the right one. If any, these 9 best dog silencers can get you started on the right track.